Behind Akaroa on Banks Peninsula is a very different rural land subdivision. While subdividing rural land into lifestyle blocks is not uncommon, what made this project unusual was the motivation and vision behind it. There was also the discovery of a hidden waterfall and uncharted streams amongst the stands of century’s old kahikatea, walnut trees and regenerating kanuka bush. The intrigue was completed by a host of characters including a Labrador with a penchant for stealing work boots and a gaggle of wild geese intent on chasing people off the property. The project started several years ago when the landowner purchased the land with the intention of restoring the historic Curry homestead and adjacent school to their former glory. Originally built in the 1870’s, the buildings form a heritage site which had fallen into disrepair since its heyday last century. The problem for our client was sourcing the funds to support this restoration work. As the property was steep and largely covered in bush, using the land as an economic unit in its own right was always going to be difficult. The solution settled upon was to subdivide and create two vacant lifestyle blocks to sell on the open market and invest the proceeds into restoring the remaining property. A building site was carefully chosen within each new block, ensuring that future owners would fall in love with the northwest views towards the Akaroa Harbour. The building sites also had to be readily accessible for vehicles and services. There is no point subdividing off land if nobody wants to buy it. The property adjoins an expanding corridor of protected bush behind Akaroa and over the Crater Rim, which includes the Hinewai and Curry Reserves. It’s a much loved and well visited area of Akaroa, so the application to subdivide had to address local concerns about the effects on the landscape and the surrounding bush. Some streams that flow through the property are tributaries to the Grehan Stream, which contains one of the intakes for the Akaroa water supply. The building sites were therefore located to ensure no detrimental effects on this important public water supply were created. In order to preserve the landscape and water supply that the residents and visitors enjoy, the landowner elected to fence and protect up to 70% of the property covered in regenerating native bush. The QEII National Trust were delighted to covenant in perpetuity this large area of bush as it extended the bush already protected by the adjoining Curry Reserve. The application proposal was a collaborative effort which included the landowner and our team of surveyors, along with input from a landscape architect, geotechnical engineer, botanist, traffic engineer, wastewater expert and the QEII National Trust. All these skill sets were needed to ensure that the proposal respected the District Plan, was environmentally suitable and created sound building sites. Typical of subdivisions in rural and ecologically sensitive areas, the proposal had to be negotiated with all the affected neighbours and the local council. However, after much discussion back and forth, the application got the go ahead from all concerned. The next chapter of fun and games then began when we started the legal survey of the new boundaries. The nature of the land meant that we had to walk the boundaries, up hills, down gullies and through dense bush – all the while fending off occasional attacks from brooding geese. Who knew geese like to nest in stinging nettle? A smart move as it meant we had double the reasons to stay out of their way. Taking your boots off was also an occupational hazard. Turn your back for a second and Baxter the Labrador was heading for the hills with them firmly between his teeth. An absolute find was a hidden gem of a waterfall. This was welcome news to the landowner who was unaware of its existence, particularly as it fell within the protected bush area. Redefining the old boundaries in terms of the current rules made for a very interesting survey. The underlying title had not been resurveyed since the land was originally granted from the Crown. Our surveyors had to research old historic survey plans and field books from the late 19th Century, as well as scratch around in the bush for evidence of old boundary fenceposts. When the work was completed, the landowner had a modern and accurate title and freshly pegged boundaries. As a legacy project, Glenwood presented legacies on many levels. Two new families will be able to build homes amidst the native bush with views of the Akaroa Harbour. 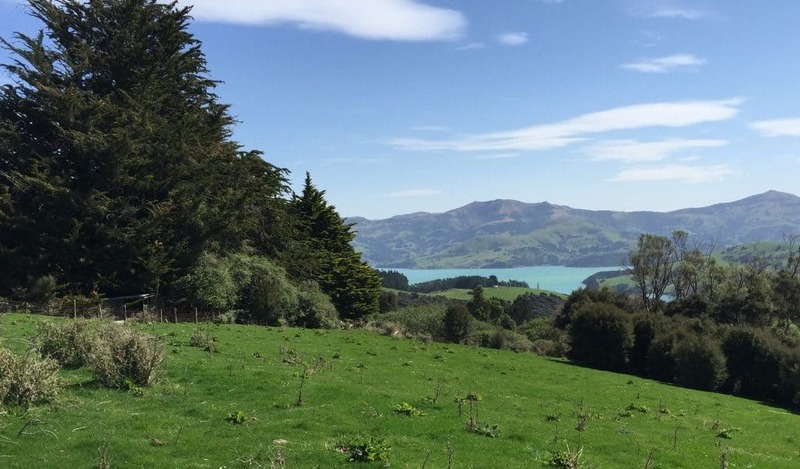 Placing a covenant over the property will allow the native vegetation to continue regenerating in perpetuity, preserving the landscape, ecosystem and Akaroa water supply. And finally, it will enable a dedicated landowner to restore a piece of Banks Peninsula heritage for future generations to enjoy.